Are you in the Garrison of God? “Blessed be the God and Father of Our Lord Jesus Christ which according to His abundant mercy hath begotten us again unto a lively hope by the resurrection of Jesus Christ from the dead, to an inheritance incorruptible, and undefiled and that fadeth not away, reserved in heaven for you, who are kept by the power of God through faith unto salvation in the last time.” 1 Peter 1:3-5. Kept, phroureo. Strong’s #5432. Kept (phroureo) is a military term picturing a sentry standing guard as protection against the enemy. It may come as a shock to many in the body of Christ but we are in spiritual combat, (not just passengers on God’s love boat) but God’s power and peace are our sentinels and protectors. Philippians 4:7 says, And the peace of God, which passes all understanding, shall keep (guard) your hearts and minds through Christ Jesus. Guard as being in a garrison (fort, castle, high tower). 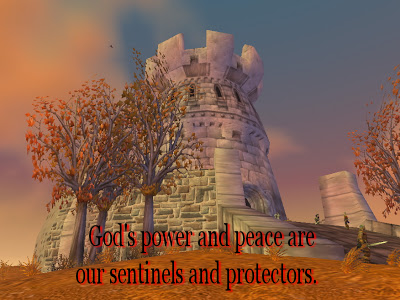 That peace which transcends all understanding shall garrison/mount guard over our hearts and minds in Christ Jesus. Previous Are You Growing Like A Stall-Fed Calf? Next Fear Of Man, Fear Of God You Choose.